CartoDB is a go-to tool for many interactive map makers. Whether they are designing a data visualization for their website, building Geo-capabilities for their application, or just taking a look at their spreadsheet of data, people are relying on CartoDB more than ever before as an essential tool for data management and visualization. As of this week, CartoDB has added two more reasons to love the service with the removal of map views quotas from all accounts and the release of two beautiful new basemaps for people to use for free. No map view quotas? If you aren't familiar with map views, most online mapping services count how popular your maps are based on the number of viewers. If you go over a certain number of views, you pay. CartoDB just changed that narrative by overhauling their pricing plans and making map views unlimited for all users. This is great news for everyone from small businesses, to students, to non-profits alike. "We realized that charging for map views was actually penalizing you for creating interesting maps. We no longer want you to have to worry about unexpected traffic or what happens when the maps on your account go viral. So as of today, we're getting rid of the map view limits. That's right, they are totally free!" wrote Andrew Hill, Senior Scientist at CartoDB. 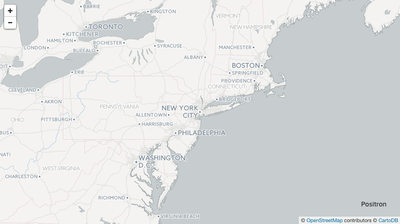 CartoDB also released a series of new basemaps this week. Named Dark Matter and Positron, these two basemaps were designed in collaboration with Stamen Design and tailored for optimized data visualization. The maps are designed to work silently behind a map makers own data, allowing styling and thematic maps to jump from the page.